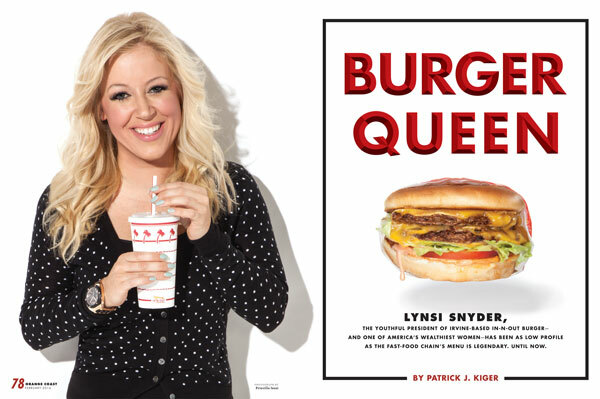 This detailed and revealing profile of Lynsi Snyder, CEO and current president of In-N-Out, rallies my respect for the 66-year-old burger chain and the young businesswoman who runs it. Courtesy of Orange Coast Magazine. The article began as a “day in the life of…” and evolved into a story about the family hardships and successes that continue to lead this dynamic company. That’s the art of storytelling. Kiger’s selection of quotes paints a portrait of Lynsi’s personality: “’I’m a lot like my dad, a little bit of a daredevil,’ she says. ‘I like an adrenaline rush. My dad took me to the racetrack for the first time when I was 2 or 3. … Anything with a motor, that was in my blood. '” Reading a quote like that, it’s easy to picture her speaking those words, with a distinct, half-grin on her face. Bottom line: It’s obvious to readers that Kiger wasn’t simply interested in revealing the inner workings of In-N-Out and the story behind the company and its president. It’s evident he also asked questions about life and family and observed Snyder—revealing her as a young mother, race car enthusiast, devout Christian and low-profile businesswoman.